Bumper: Hand-pintucked with signature 4” wide ties. Sheet: Machine washable 100% Italian Cotton. Skirt: Hand-pintucked, gathered skirt. Shown with a puddle. Coverlet: Hand-pintucked. Also available as a duvet. Ballet Pink, Ivory, Oatmeal, Blue, Robin's Egg, Maize and Linen Scrim. Fabrics are available by the yard - 3 yard minimum. Please contact us for fabric information. 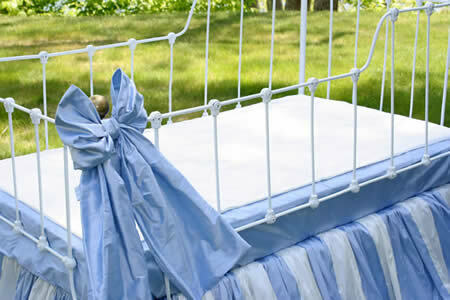 All pillows and crib coverlets should not be used in crib with baby. 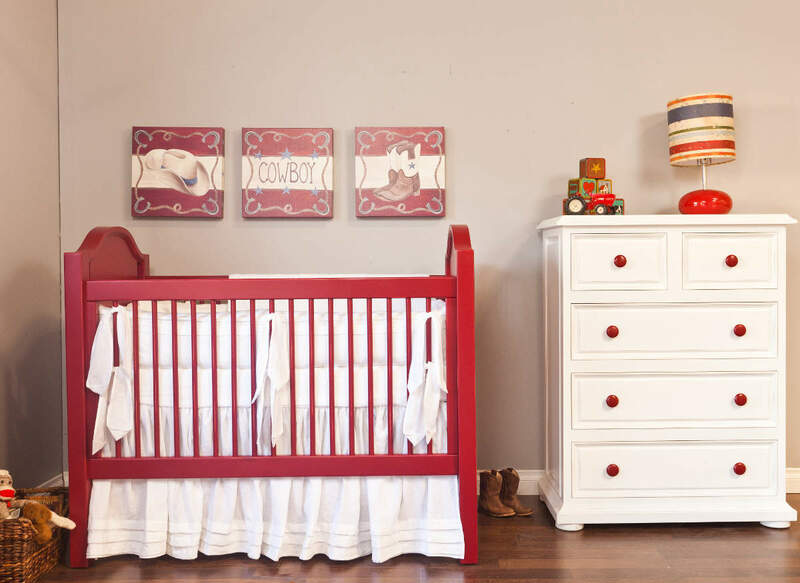 Bumpers should be removed from the crib when baby begins to pull up. If carrying a baby in the moses basket, never use the handles only. Be sure to support the bottom of the basket as well. Once the baby can roll over or weighs about 14 pounds, moses baskets or bassinets should be discontinued. Collection Color. This collection is constructed using one color for all components - bumper, fitted sheet, bed skirt, and ties. Skirt Length: The skirt length for this collection was meant to puddle on the floor. Select the length desired. - Traditional Decking is a rectangular-shaped fabric with 4 skirt sections sewn to each side. The decking lays on top of the mattress spring and is not seen once the mattress is placed on top. - Double Decking is constructed as 2 separate pieces that are layered one on top of the other. Decking One has two skirt sections sewn to the long ends of the decking. The shorts ends have no skirt sections sewn to it. Decking Two has two skirt sections sewn to the short ends of the decking. The long ends have no skirt sections sewn to it. Decking One gets laid onto the mattress spring. Decking Two gets laid onto Decking One. Mattress gets placed on top. All four skirt sections can now be seen, while the decking sections are hidden under the mattress. Unlike traditional decking, double decking allows the separate decking sections to be folded and pinned so that if the mattress position is lowered, the length of the skirt can be adjusted accordingly. It's always a good idea to have extra sheets on hand. 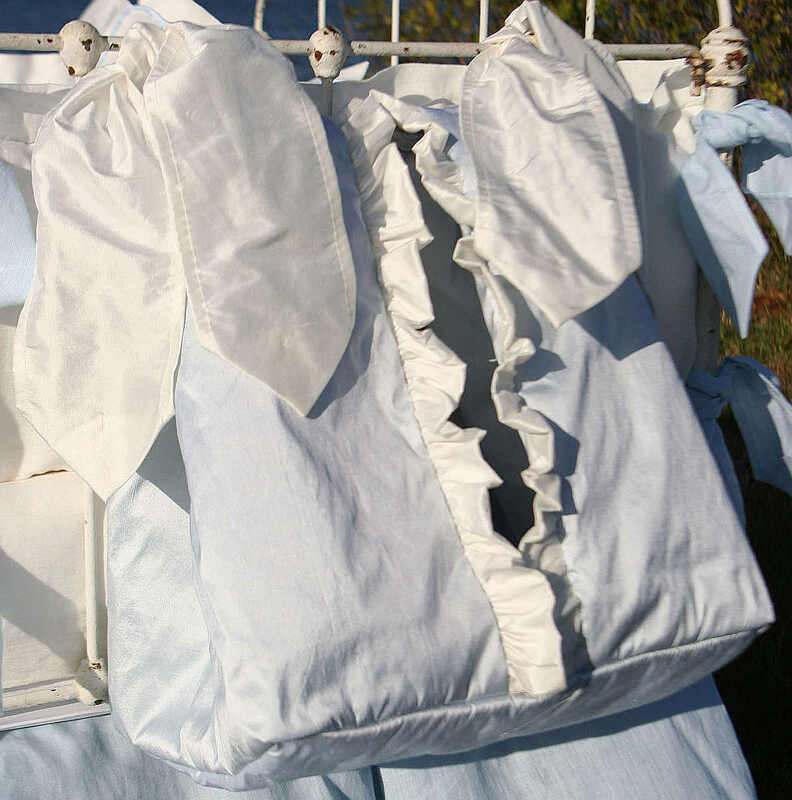 Fitted sheet is machine washable 100% Italian cotton. Pillow includes 3 extra large pintucks. Top in the fabric color of your choice. Bottom fabric is an Italian cotton in a color that matches the top fabric. Zipper at bottom. Optional down insert. Two rows of 3 extra large pintucks on top side only. Top in the fabric color of your choice. Bottom fabric is an Italian cotton in a color that matches the top fabric. Two rows of 3 extra large pintucks. An elegant way to keep toys close at hand. Toy bag style will be matched to the crib ensemble style and may differ from photo. To fit a standard 34"x16x4.5" contour changing pad. Customized sizes are available. 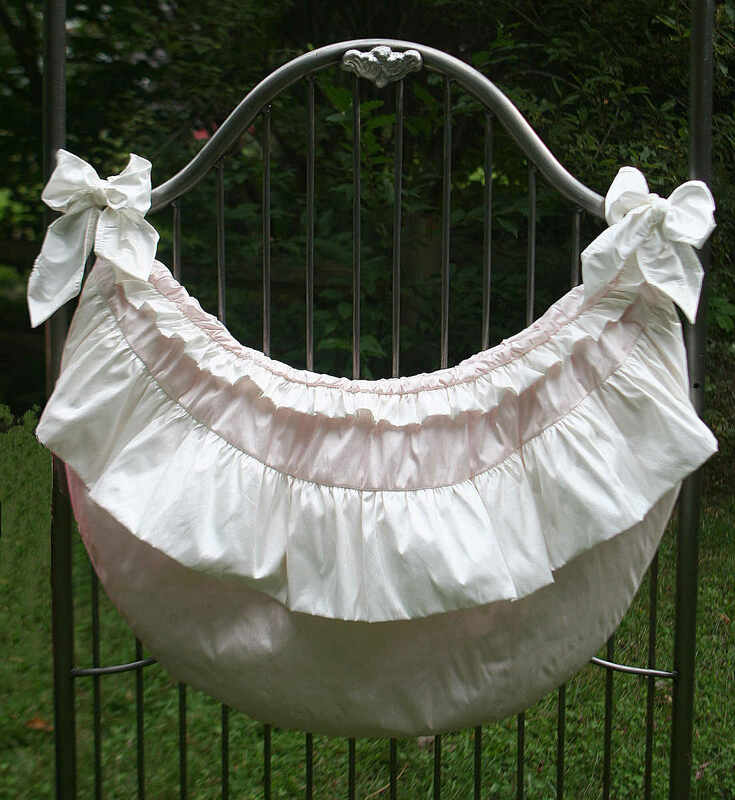 Diaper stacker style will be matched to the crib ensemble style and may differ from photo. After adding this item to shopping cart, please enter 1-3 letters in order of appearance on bib if you choose to have the item monogrammed. For monogram on a bow, please indicate one letter only. 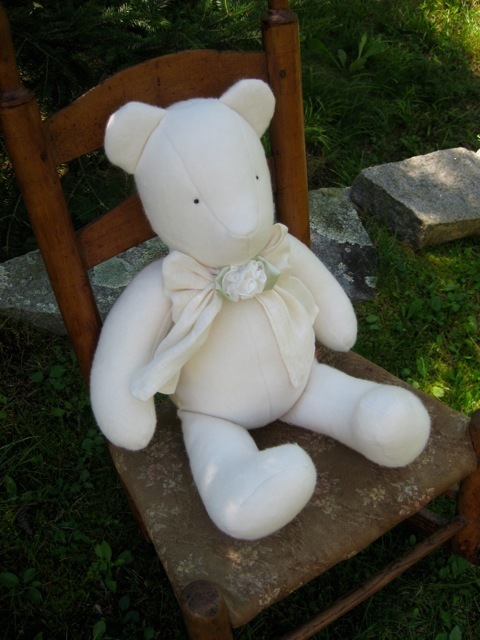 18" Tall with bib or bow. Available in any ensemble fabric color or natural organic cotton Sherpa. Optional monogram. 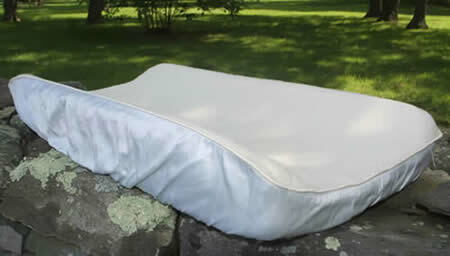 A mattress protector, that sits on top of the fitted sheet and is secured to the crib on all 4 corners with string ties. 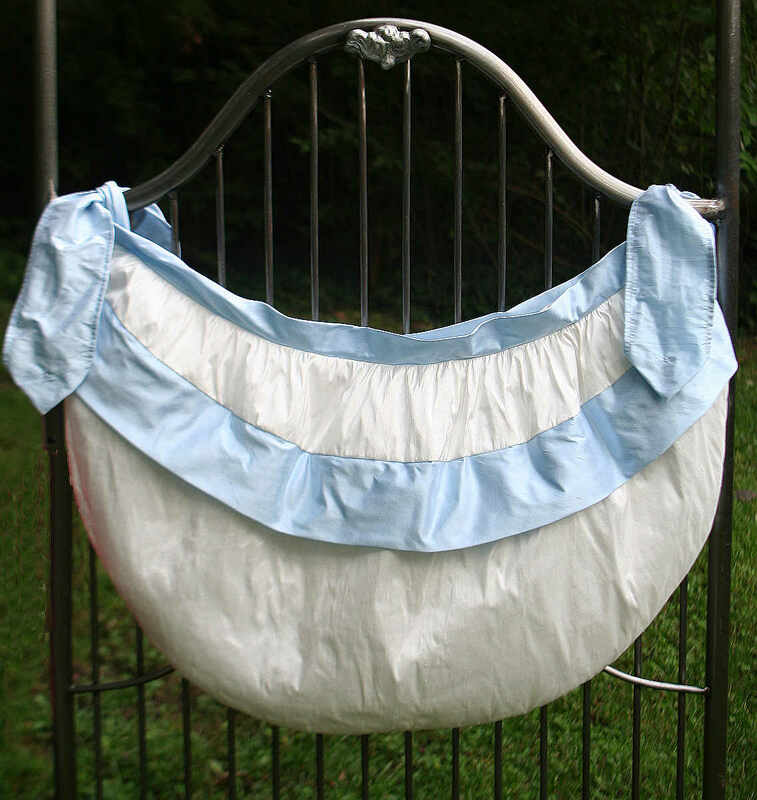 The crib bib is a casing constructed of an Italian cotton with an opening at the foot to allow for a waterproof pad to be slipped in.